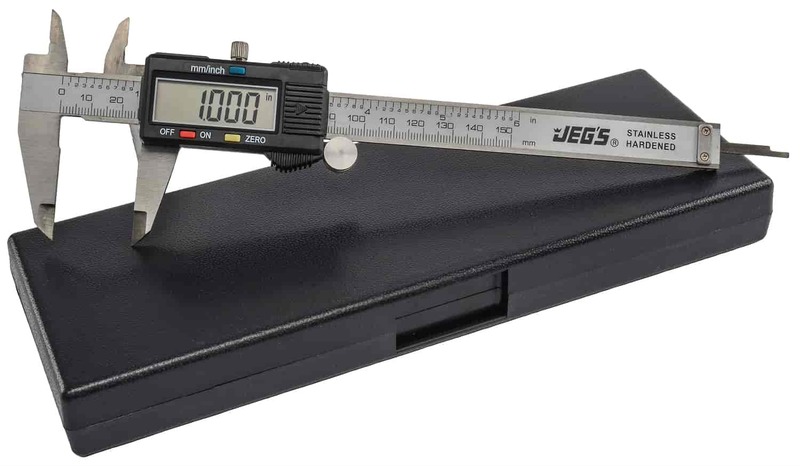 Not every measurement is made of even increments so put down the ruler and get accurate with JEGS Digital Calipers. Both measure up to 6" in 0.001" increments and display SAE or metric on a LCD screen. Use for most any inner, outer, or depth dimension. Power switch preserves included battery. 80519 is rated 4.5 out of 5 by 13. Rated 5 out of 5 by DBerry from Exceptional value Very nice digital calipers. I like the instant on when starting to take a measurement. Rated 5 out of 5 by TexR from Digital Caliper I bought this product a month ago and I'm glad I did. Rated 5 out of 5 by decku1 from great product for the money i bought this tool a few weeks ago to measure cylinder bores, does a fine job. Rated 5 out of 5 by Artg from Excellent tool This is a highly precise, multifunctional instrument. It is rugged and well made. The price is amazing! Rated 5 out of 5 by Re Ly On Racing Team from Shop Tools Item was just as described. This was just what we were looking for to work on both are American Cars & Import Motorcycle's! Rated 4 out of 5 by Ping42 from Handy unit. Good for the price. Slide is not as smooth as I expected. Could use some better QA during manufacturing.